NW2SE Part One. 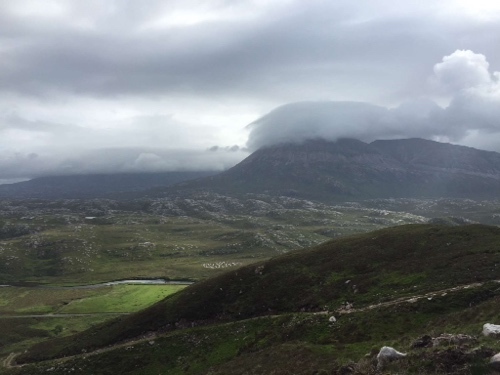 The Cape Wrath Trail – Brutal but Epic. The phone rang for ages but no one picked up. I left a message when the answer machine kicked in. 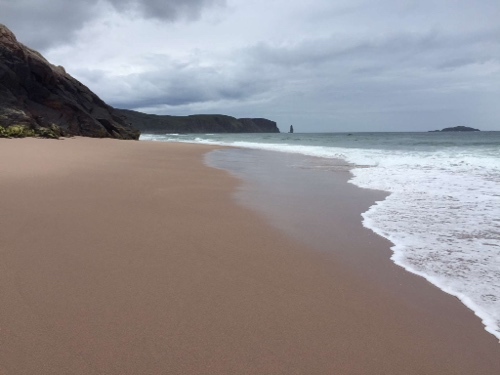 I left Durness and began walking the three miles to the small ferry that takes passengers over the Kyle of Durness, and onto a waiting minibus for the hour’s journey up a bumpy track to Cape Wrath itself. Ten minutes later my phone rang. Pleased that the gamble had paid off, I reached the ferry after an hour but the seven people before me filled it to capacity so I waited by the dock for the next service an hour later. 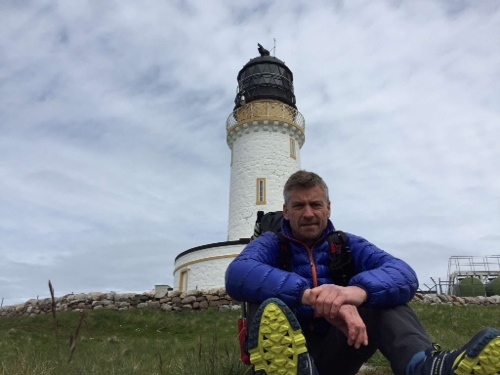 At the start, and Cape Wrath Lighthouse. Full of expectation. 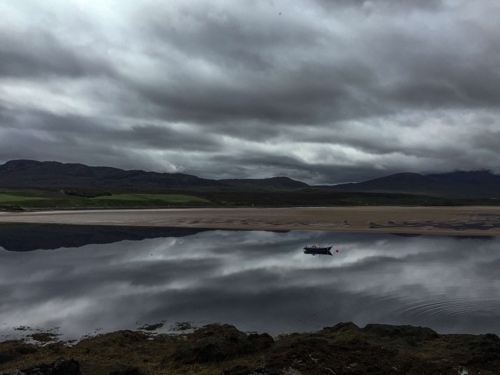 The Kyle of Durness was still, the water calm and reflective, mirroring the sand that it’s waters weaved through. A solitary boat stood motionless, it’s red buoy offering a little colour. A cheese and pickle sandwich at the small cafe just by Cape Wrath lighthouse delivered some hiking fuel and after a brief rest admiring the plunging coastline, I set off south towards England. This is a remote corner of Great Britain. Few people live up here, Atlantic storms come barreling in relentlessly, with no land mass to temper their momentum, this west coast takes the brunt of their anger. The land is ripped up, and remains damp for most of the year. 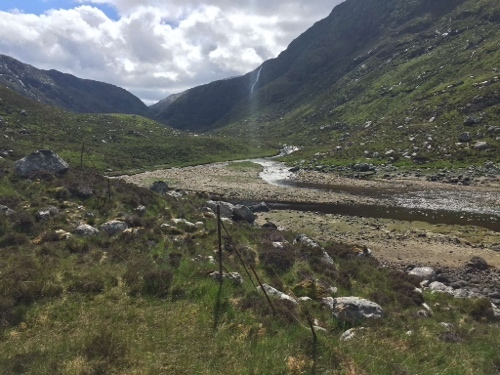 The Cape Wrath Trail weaves a route through this inhospitable landscape, at times on faint tracks, sometimes on quiet roads, or over rough terrain where it’s an achievement to actually find any form of trail at all. It hops over rivers and streams, hugs the shoreline of countless lochs, and somehow threads a route through. The coastline is rugged, dropping aŵay suddenly to secluded beaches with white sand and a turquoise sea. The rocks vary from grey to at times, what appears red when the sun hits them just right. Stopping occasionally I can hear the waves reaching land. I headed to Sandwood Bay, just an afternoon’s walk and a chance to warm the muscles a little. Stumbling over rough ground, my shoes were soaked after an hour, sinking into water saturated soil and bouncing over moss. Sandwood Bay. Been on the bucket list for years. Finally the route plunged down to a small beach where I curved round a finger of rock to reveal Sandwood Bay itself, arching away southwards. 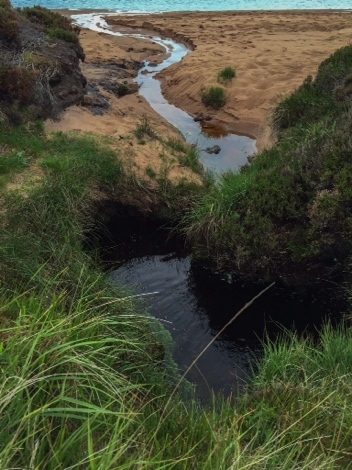 Faint footprints were fighting a losing battle with the tide and I collected water, waded across the outlet of Sandwood Loch, and followed the curve of the beach. I reached the far end and veered left into the dunes as a light rain began to fall. Waiting for dark in Scotland at this time of year is a patient game, if indeed you can delay your sleep that long. The sun is just setting at ten, it’s not fully dark until gone eleven and light again just after three in the morning. You wake wondering if the night ever came at all. The light paints a mesmeric landscape, softening any harsh edges. Early morning brings overcast skies but tempered with swirls, ripples and eddies as the light glances over. In the evenings the colours emerge, enhanced, and with a richness that brings the browns of the heather, the greens of the grass and the grey rock alive. Stay awake long enough and you’re camera will love you. I see Glendhu Bothy is in striking distance for the day. Only twelve miles perhaps but the chance of a dry night away from the midges is too kind an offer to turn down. I toil up Ben Dreavie, a solitary cairn at the summit offering a bearing, and I dive down to weave a route through Lochs and gushing mountain streams. My feet are soaked and the appearance of a well maintained, dry track stretching most of the way to the Bothy makes me smile. Turning left, I reach Loch Glendhu and hug it’s shoreline as a cluster of three houses appears distant. The first is the bothy itself and as I creak open the front door, smells of a recent fire greet me. There are two rooms downstairs, and a loft also. I choose to make downstairs my home for the night and being only four in the afternoon, spend the rest of the day relaxing, cooking and making the most of the abundant sunshine. What followed in the morning was one of the hardest days hiking I’ve ever experienced, and I only managed fourteen miles. The start was par for the course, a light rain began to fall and became heavier as I skirted the southern flanks of Beinn Aird da Loch. 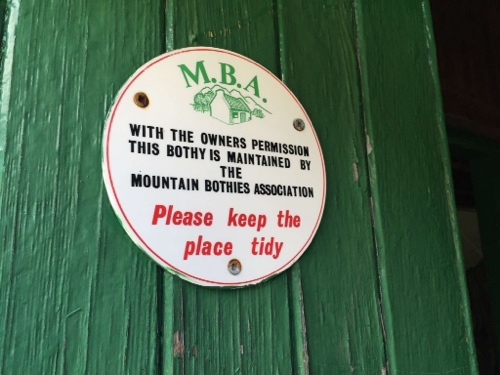 Reaching the Glencoul Bothy was the point where I discovered what hiking in Scotland, and The Cape Wrath Trail was all about. Wild, wet, windy and over terrain that at times, had me scratching my head wondering where I was. 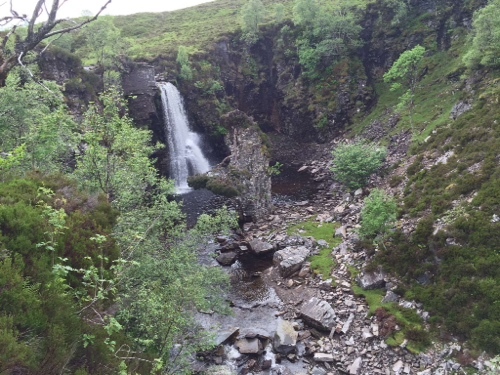 The route weaved up a valley between the Stack of Glencoul looming over me to one side, and Leitir Dhubh to the other, awash with one of the most gorgeous waterfalls I’ve ever seen. The trail steepened and for hours I somehow managed to weave a route over high ground with little to navigate on. I finally stumbled into the Inchnadamph Hotel late in the day fit for nothing. The route is dotted with bothies. These old, charming and welcome shelters are just that, an escape from the elements. I love my tent but there’s something about a bothy that makes them irresistible. 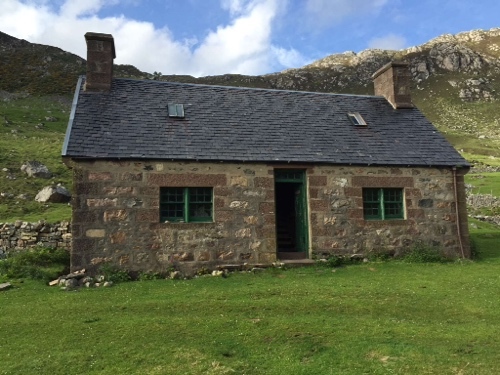 The Old Schoolhouse Bothy near Duag Bridge was a prime example. Even some of the original chairs and desks occupied one room. It was quiet, no one was about, and a light breeze saw off a few midges. I slept well and again, woke wondering whether the night ever actually came. Currently just over half way, I’m taking a days rest in Inverlael. I think, or hope rather, that the hardest section of the trail is done. I have around ninety miles left to Fort William where I’ll pick up The West Highland Way, stopping North of Glasgow. From there the favourite option is to meander over to the Pennine Way and head south. After that, as you know, I have no plans . . .